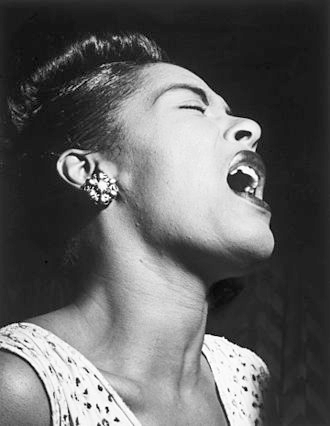 Tune in to WKCR on Friday, April 7 in celebrating the life and work of virtuoso jazz vocalist Billie Holiday with our annual 24-hour birthday broadcast. Holiday was born Eleanora Fagan in Philly in 1915. Despite an intensely difficult childhood, Holiday honed her craft young by learning songs by Louis Armstrong and Bessie Smith. In 1929, she joined tenor saxophonist Kenneth Hollan and slowly built her reputation as a vocalist, replacing Monette Moore at Covan’s on West 132nd in 1932. When producer John Hammond saw Holiday for the first time at Covan’s, he was instantly captivated by her. He secured a record deal and she recorded two tracks with Benny Goodman. Soon, she began to record under her own name, collaborating with great artists of the swing era including Lester Young and Roy Eldridge. With pianist Teddy Wilson, she manipulated the melodies of jukebox pop songs. Shifting the rhythm of her phrases and changing the vocal emphases in the music, she influenced generations of instrumentalists and vocalists alike and became one of the leading female lights in the male-dominated field of Jazz. She courageously recorded the anti-lynching ballad “Strange Fruit” with Commodore Records when Columbia rejected it because of “controversial” subject matter. Though her career was strained by substance abuse and heartbreak, her successes were remarkable. She is still remembered for the searing honesty of her tone, the creativity of her song alterations and the rawness of her sound.